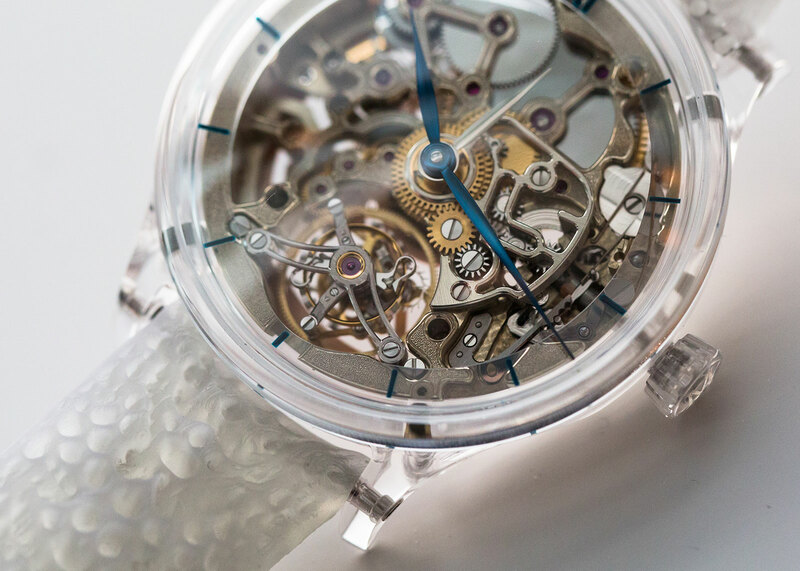 Priced at one million Swiss francs, the H. Moser & Cie. Venturer Tourbillon Dual Time Sapphire Skeleton is a publicity strategy shaped like a skeleton tourbillon inside a sapphire crystal case. With the Venturer Tourbillon as a base, H. Moser & Cie. has created its most expensive watch ever. 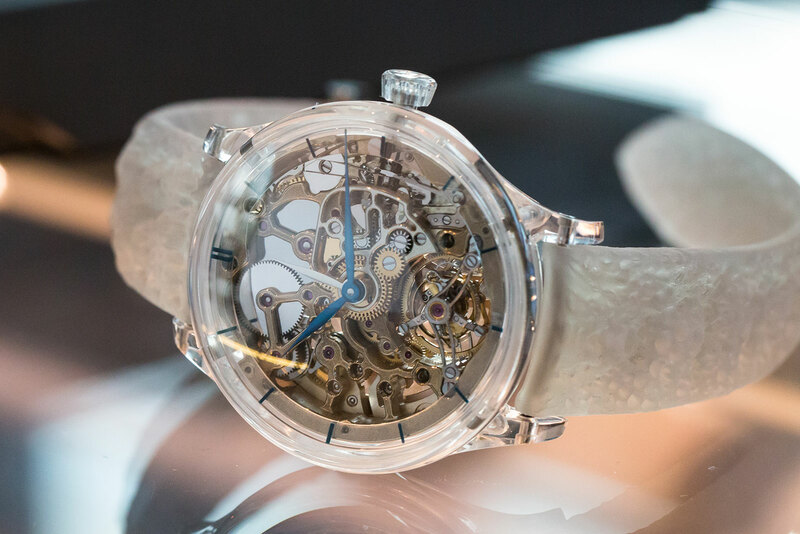 Once a modest manufacture of discreet and concise watches, H. Moser’s latest creation is a skeleton tourbillon inside a clear sapphire crystal case, fitted to a rubber strap that has been 3D printed. 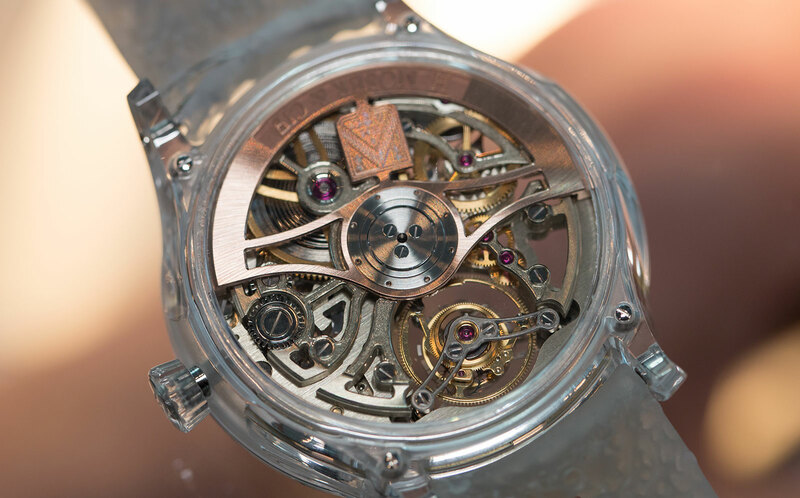 The HMC 803 movement has been open worked, and the bridges decorated with a hand-engraved motif. Unplated German silver is the material of choice for the bridges and base plate, meaning they will develop a patina over time as the alloy reacts to the atmosphere. Machined from a sapphire block, the case is completely clear. Even the crown is in sapphire crystal. Though not named, the maker of the case is probably Stettler, a specialist in sapphire and ceramic cases that makes the sapphire cases for the even more exorbitant Richard Mille sapphire watches. The strap is rubber, slightly transparent with an indistinct organic pattern on its surface, printed on a 3D printer. An alligator strap is also available. The Venturer Tourbillon Dual Time Sapphire Skeleton is a one-off piece with a price of 1 million Swiss francs, or about US$1.01 million, a price that will surely garner publicity. It will be available at renowned Parisian watch retailer Chronopassion. H. Moser & Cie. adds two blue timepieces to its collection at SIHH 2016, the Endeavour Centre Seconds Concept Funky Blue and Venturer Small Seconds XL - specs and prices follow.